As of today (December 3rd, 2014) this is my current binary. I've included the 1GB disk file so you can skip the whole booting into MacOS, and partitioning/formatting the disk. But I want to leave how I did it, in case someone wants to create the disk file in a different manner. * A note on using Shoebill. The mouse will be captured when the window is selected. To release the mouse, click the right mouse button. If everything goes well you'll be greeted by a login window. Login as root, with no password. So the first thing you will probably want to do is create a new disk for an "installation". A/UX can mount both HFS and UFS disks, but only the 'System 7' side of things can read both sides. Depending on what you want to do with A/UX will depend on how big you want the slices. Because virtual disks are cheap, and you can have 6 SCSI disks, I highly recommend going with additional disks for whatever task at hand you want. Because this is old software with some signed 32bit integer issues I try to keep everything under 1GB (Shoebill on Win32 has issues with disks bigger than 1GB). 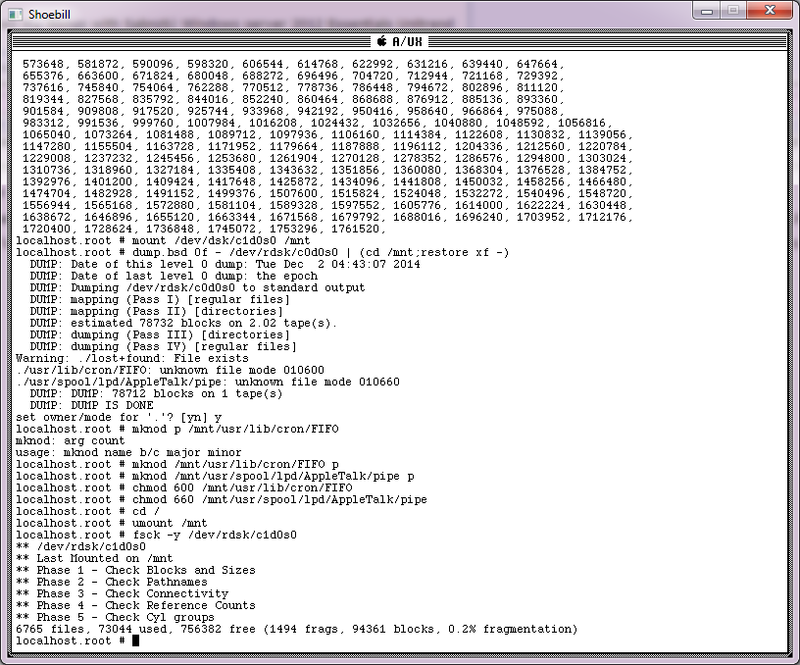 I like to use qemu-img for this task. I don't know how to initialize a disk from the command line, and currently Apple HD SC Setup crashes Shoebill, but my build of Basilisk II (Cockatrice III) will run it (as long as your disk image is under 1024MB) And you can run HD SC Setup to partition your disk image. I went ahead and used a 868MB root with the remainder for swap. Also take note that you still have to format the partition. And once we are in 'text' mode we can start by formatting the harddisk. And some numbers will go flying by. And that has everything recreated. Finally let's dismount and check the disk for errors. This should be clean, but it's always good to verify. * A quick note, always try to shut down the guest, quitting the VM, while it is not at this blank 'You may now switch off your Macintosh safely." screen may result in file corruption/loss and even a non-booting disk image! Now we can boot from our newly created disk. And if everything went well, you should be presented with the login screen! Now that we are booting up, this is a great time to make a small alteration to /etc/sysinitrc so when it runs fsck you aren't prompted every time. And now you can reboot the system once these files are created/updated. After a reboot, you can ping the address 10.0.2.2, and you should get a reply. * NOTE that this is the ONLY address that you can ping from SLiRP! You can also telnet to bbs.superglobalmegacorp.com (or vert.synchro.net) and the DNS should resolve, and you should get prompted to login to a BBS. This is only meant to demonstrate that the TCP/IP connection is working. Take note that the SCSI ID does matter! In this case disk1 means SCSI ID of 1. If you are going to use a different number the /dev/dsk/cXd0s0 will have to reflect that different number. Now if the file is modified correctly you can mount the partition and verify it's mounted. This is for NetHack, and HTTPD. Running this will link NetHack into your games directory. Naturally you'll want to add /usr/local/bin into your path. According to here, the best way is to modify /etc/profile. Unless you set a root password, it'll automatically boot from the CD into the desktop. This makes it difficult to change the session type. But thankfully virtual disks are cheap, and it's easier to make two copies of the ISO, and use both ISO's in the scsi disk chain. This way you can boot off of one, and have the other unmounted so you can dump/restore from that one. 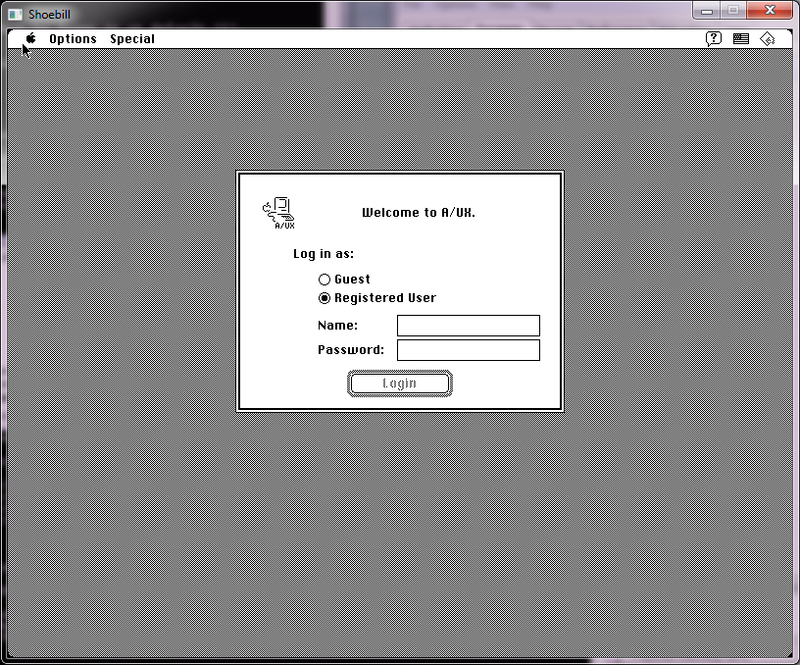 I just upgraded A/UX 3.0.1 to A/UX 3.1 using the AWS 95 Software Upgrade. It went flawless. Networking still works! I'd like to wikify this. Any thoughts up updates or changes? A more recent binary? and neozeed's build from this thread with slirp enabled. Any Windows builds of .5 floating around here? Okay, so these are sort of hard for me to follow. Can someone clarify the command I should use to boot after I have created a disk image (or am using the provided disk image). Should I use something like "shoebill.exe rom=macii.rom ram=64 disk0=Apple_UNIX.iso disk1=Apple_UNIX2.iso disk2=root.dsk"
And how do I change the session type? Also: the mouse is almost unusable for me. Anyone else experience this? 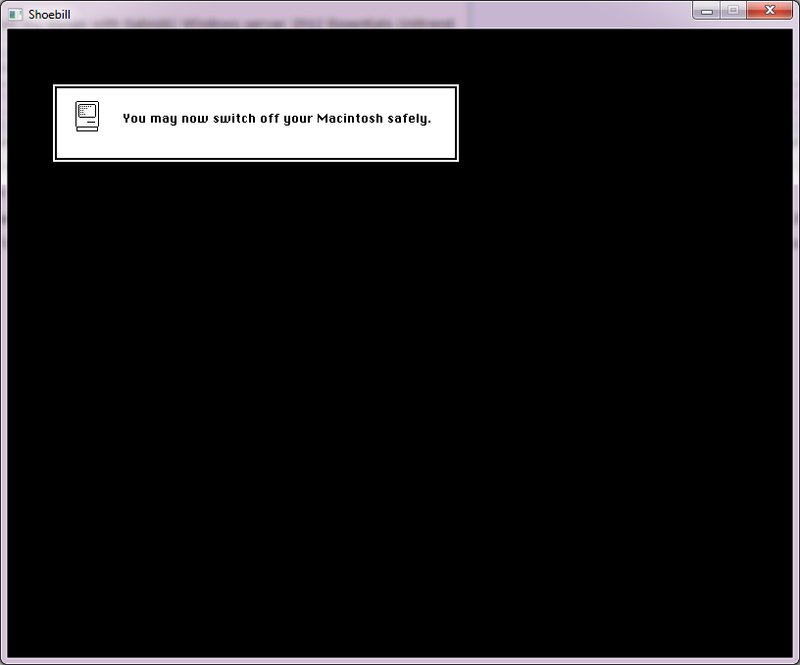 Well, i am not experincing the mouse issue but sb won't start! “iThank you, steven p. jobs." Try using the AUX iso from Macintosh Garden that is "for Shoebill." Will Shoebill handle one of the boot disks provided? The latest by Neozeed shows only a white screen here (w10, 64bit). For Windows, use the 0.4 32-bit release from the developers website. This works. 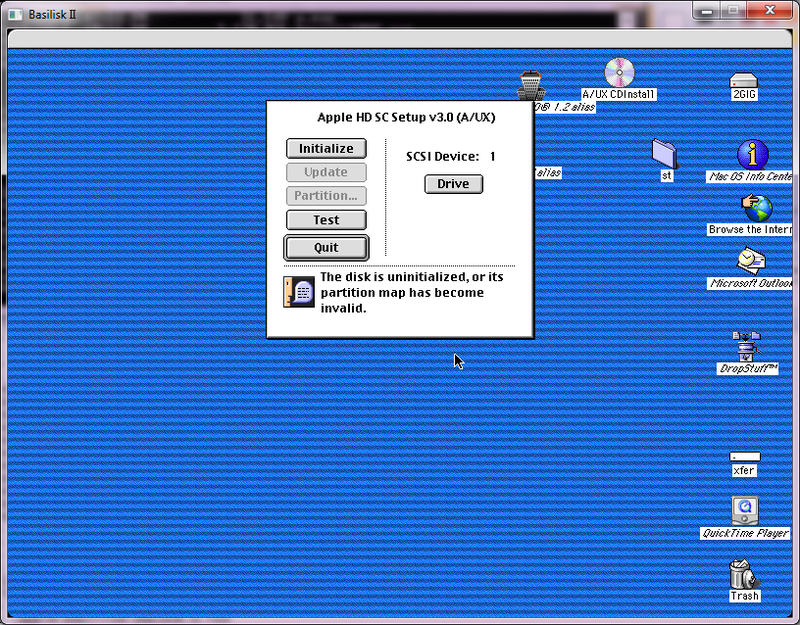 Use the Apple_UNIX.iso from the macintosh garden to boot A/UX. This will get you to the login screen. Default user is root without password. 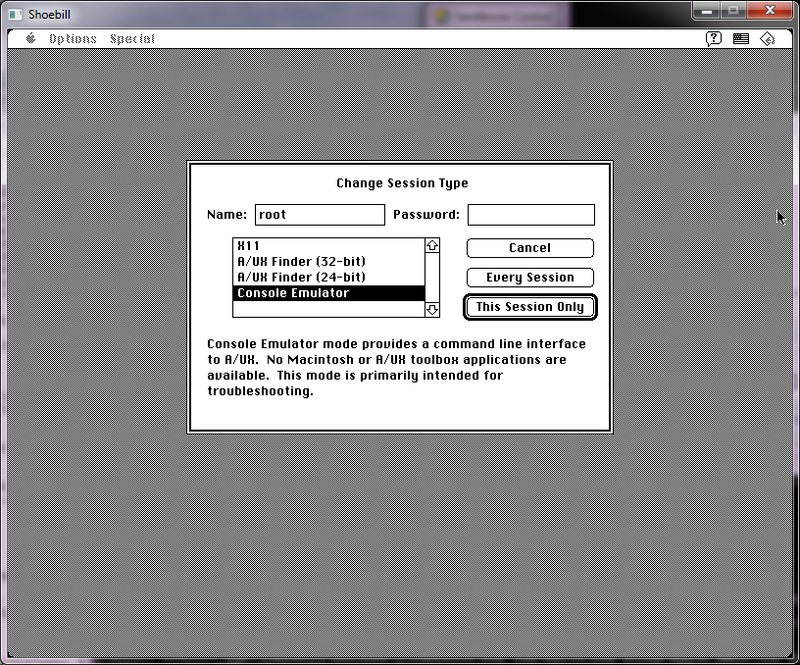 At the login screen use the Options menu to change the session type. Besides rom and disk(s), you can set window size with "height" and "width", and verbosity of the start-up process with "verbose"
Short answer: no, and no. How is the mouse performance on your system? 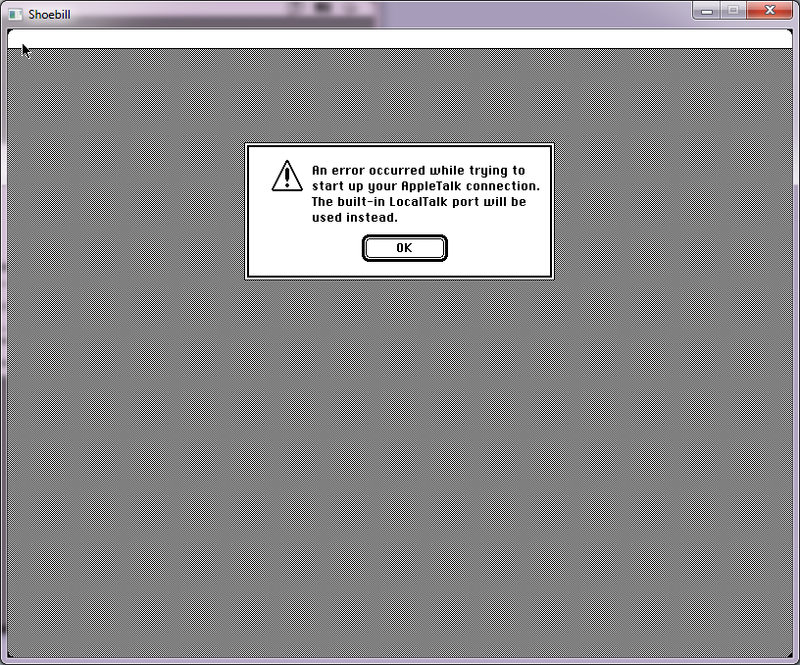 My emulation is just about unusable because of poor mouse control, including a drifting cursor. I have no mouse issues. I don't know how fast your system is, but speed seems to have a profound impact on mouse performance. Turns out the MACII.ROM was fake. Was actually Mac SE. Can someone teach me how to transfer files between simulator and host via slirp? I have tried ftp and tftp, but without success. Seems to be the command ftp builtin A/UX is does not support PASV mode. The virtual machine behind a host can initiate outgoing connections, but it can not open any ports to accept inbound connections. I found some command in the local image. I put the files in to a http server, and use wget to download them. And I found a lot of GNU tools such as gcc, I am very happy. Thanks, neozeed! However, another problem is: Who can build a Shoebill of Linux version for us, The Last release v0.0.5 support SLiRP, but the sources on github is a XCode project, and I have no a Apple machines. . .